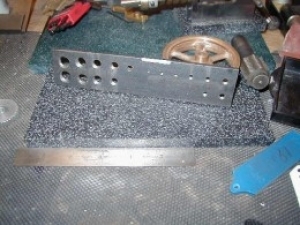 Homemade bolt shortening tool consisting of a steel plate with tapped holes in a range of sizes. Bolts are screwed into the corresponding hole until the excess length protrudes on the other side of the plate, then trimmed off with a saw. Great idea! My need for resizing bolts is quite often and a fixture like this would be a great addition to my toolbox.